MOTOR HIGH TORQUE - ECHO1, AIRSOFT BRASIL , PISTOLA PARA AIRSOFT, ARMA PARA AIRSOFT, LOJA AIRSOFT, FULL METAL, M4A1, SNIPER AIRSOFT. The Echo 1 Ultra Torque Motor is a great new alternative to increase the performance of your AEG. 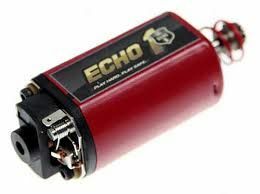 Echo 1 is very well known for making great quality products at affordable prices and this motor is no exception. The magnets are extremely strong, the pinion rotation is very smooth, and the craftsmanship around the terminals and brushes is exquisite. Make sure that your AEG is running in tip top shape with this Echo 1 motor.